It’s been quite awhile since I’ve taken the camera out for a spin. I decided to take a PTO day today, making it a four-day weekend, and on my first morning off work, I took the trusty Nikon over t0 Encanto Park in Phoenix. I’ve lived in the Valley for over ten years now, but had never visited this park. It’s actually a nice little oasis in the middle of the older section of town, although it’s starting to show its age (and the impact of the city budget cuts). There’s a golf course, a small lake, and little streams feeding off the lake in a loop through the park. There are plenty of swans, ducks, pigeons and geese roaming the grounds and swimming in the water, providing an abundance of photo ops. The skyline of downtown Phoenix can be seen to the south over the palm trees, providing an interesting backdrop. I just got home a short while ago and transferred my shots to the computer and started browsing through them. This one has to be one of my favorites. 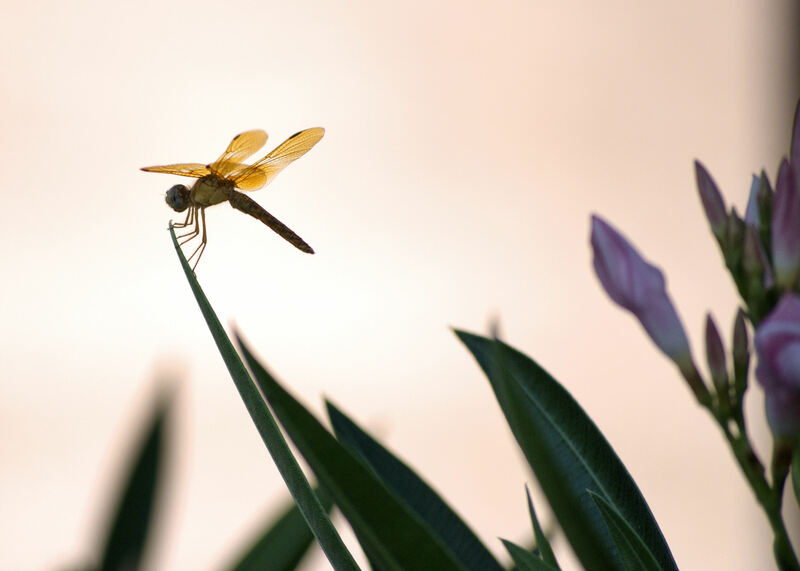 I love the delicate look of the dragonfly’s wings, as well as the gentle colors created from the shallow depth of field. I took this shot using my telephoto lens, which gave me a nice blurry background from the pinkish sand. There was actually more greenery in this shot, but I cropped it down to what I felt were the essential elements. I didn’t do a lot of processing, just a little contrast adjustment and local tone-mapping in Paintshop Pro. I was in the park from about 9:30 to 10:30AM, and it was already 104°, on its way to 115°. There’s not a huge amount of shade out there, so I was pretty drained after only an hour…plus the midday light isn’t the best for shooting. I definitely plan to go back either early in the morning or late in the evening to try my luck again. I think I got a lot of great shots and can’t wait to start processing them, but couldn’t wait to share this one! This entry was posted in Shooting and tagged animal, Arizona, AZ, bug, camera, D5000, depth of field, dragonfly, Encanto Park, insect, Nikon, Paint Shop Pro, park, Phoenix, photography, pink, telephoto, wildlife, Zen. Bookmark the permalink. This is an amazing shot! Great detail of the legs! Really nice shot; amazing details. Despite the strong backlighting you managed to capture a lot of detail up front too. Great overall composition.